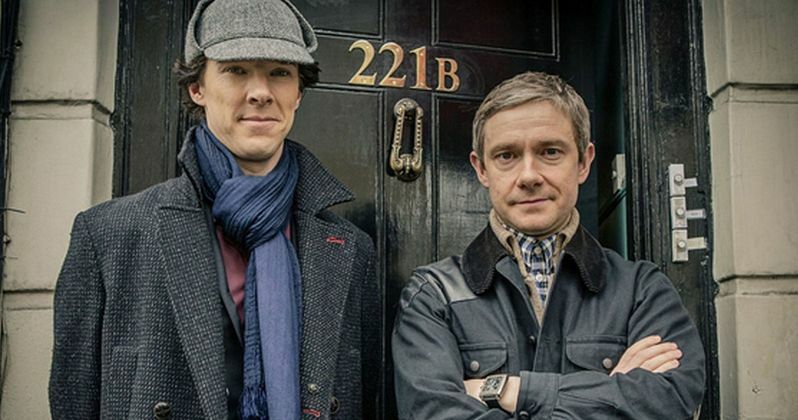 Earlier this month, new details surfaced regarding Sherlock's highly-anticipated Christmas special, which will take Sherlock Holmes (Benedict Cumberbatch) and John Watson (Martin Freeman) back to Victorian England. That special will air later this year, with Season 4 set to follow sometime in early 2016, although a specific release date has not been given. Series co-creator Steven Moffat offered some new details regarding Season 4 to Entertainment Weekly, teasing that he and co-creator Mark Gatiss have not started writing the season yet, but that the new episodes will center on "consequences." "We haven't started writing it yet, so it's early. The first series was all about the beginning of their friendship. Second about the formative stages, the love and fear and loss and all that. The third was good days, me and my pal and my pal's wife. Those are golden days. The missing element in a lot of Sherlock Holmes adaptations is allowing it to be funny. There's a lot of humor in Sherlock Holmes, and it's ignored in a lot of adaptations. [Season 4] is going to be... I suppose you'd say... consequences. It's consequences. Chickens come to roost. It's dark in some ways-obviously it's great fun and a Sherlock Holmes romp and all that-but there's a sense of... things... coming back to bite you. It's not a safe, sensible way to live. It's hilarious and exhilarating some days, but some days it's going to be bloody frightening." When asked if Season 4 will be more serialized than previous seasons, Steven Moffat confirmed it will have the same format, three 90-minute episodes featuring an "ongoing mystery." "Probably. A lot of serialization is latent, isn't it? It's hidden. Series 3 doesn't look very serialized, but you look back at how much we're setting up Mary [Amanda Abbington] to be who she turns out to be. It will be three stand-alone films, 90 minutes each, and an ongoing mystery, as there sort of always is." While he wouldn't tease any specific story details, when asked how fans are going to react when Season 4 is released, Steven Moffat had this to say. "Hmmm... desperate for series 5. We're certainly going to put them through the mill. It's going to be more of an emotional upheaval. Hopefully enjoyable and fun, all the things Sherlock must always be. It will be tough at times. Maybe that's the word? A tougher series. Intense is probably right. You can sort of see that in the way series 3 went. It's great that he's back and John's [Martin Freeman] got a wife and Sherlock [Benedict Cumberbatch] likes her and isn't it adorable, and then it all goes to hell. Remember where we left them." Since the series launched, Benedict Cumberbatch and Martin Freeman have gone on to be big movie stars in their own right. The big delay between Season 3 and Season 4 is partially due to the actors' increasingly busy schedules, but Steven Moffat added that they still keep coming back because of the "acting challenges" the show provides them. "The reason we still have Benedict and Martin is we still give them acting challenges. Otherwise they wouldn't come and play with us. They don't need the money. What we give them in terms of money isn't something they'd regard as a significant fee anymore. We're making this in a shed in Wales. We think really carefully about giving them something to play because they're both amazing actors. Normally if you watch a show, [the characters] tend to narrow as the people who make the show tend to know what works. When I was doing series 3, I went and looked at Martin and Benedict's other performances to remind myself of what else they do. I watched the British The Office again. I hadn't quite realized the extent he plays the lead in that. It reminds you that he's got all that too. I can bring in other colors to it." Several fans are still wondering if the show plans on bringing back Andrew Scott's Moriarty, who was killed off at the end of Season 2. Given how popular the character was, Steven Moffat was asked if he regretted killing off the villain. Here's what he had to say. "We knew we had to be bold about that. We knew what we wanted to do. Moriarty is only in one story, "The Final Problem," and has a flashback appearance in another. The story of Sherlock Holmes isn't Sherlock vs. a criminal mastermind. It just isn't. So we wanted to have a huge story for "The Final Problem," but kill him... we knew what we wanted the consequences of that moment to be. Andrew became a star overnight. He became a star based on the smallest amount of screen time ever-he's not actually in it that much. He's hardly in the first series at all. Even "The Reichenbach Fall," when I was doing a pass on [the script], I added a couple scenes because he's got to show up more. He's always asking, 'Do I get a flashback? Am I going to show up again?'" Sherlock has always debuted in the U.K. first, before airing in the U.S., but HBO recently announced that the new season of their hit series Game of Thrones will debut simultaneously in 170 countries worldwide. When asked if Sherlock should receive a global release, Steven Moffat had this to say. "I really, really do think it should. I think it's absolute bloody nonsense. The audience is not prepared to wait. [Somebody] recently said, "If I want something and it's not available, I think it's the vendor's fault." With Doctor Who we pretty much have that-certainly with Britain and America, it comes out the same day. Doing that ended an awful lot of the piracy. Yes, it should be. But that's a question for PBS and Masterpiece."